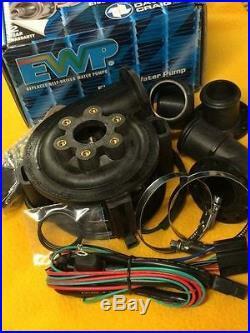 80LPM Electric water pump kit EWP80 Davies Craig 8005 2 Yr Wty. Electric Water Pump (EWP) kit. Suits all NA and Turbo Vehiles up to 3 litres. Includes EWP, harness, relay, fuse, straight and elbow adaptor, o ring, 3 and 6 mm sleeves. EWP's are designed to replace the existing mechanical water pump (or can be used as a booster). They improve engine cooling management allowing more power, torque and fuel economy. Combined with a thermofan and Electronic control unit they can be used to control heat soak and cool down periods (they will continue to run aftre the engine is switched off) and decrease warm up period. EWP, harness, relay, fuse, straight and elbow adaptor, o ring, 3 and 6 mm sleeves. 32 - 51 mm (1-1/4 - 2). Detailed instructions, electrical and mounting hardware, hose clamps. Standard post is without tracking. If you cant collect from that address the order will need to be cancelled. We combine post on most orders. Do not checkout to pay for this item (yet). Checkout with this new invoice. GST is included in all our prices. But we will contact you ASAP to let you know if there are any problems. Packaging is not part of the'sale' and may vary to that shown, may not be included in the package when sent and if damaged isn't considered to be damaged goods. The item "80LPM Electric water pump kit EWP80 Davies Craig 8005 2 Yr Wty" is in sale since Tuesday, October 21, 2014. This item is in the category "Vehicle Parts & Accessories\Car, Truck Parts\Cooling Systems\Water Pumps". The seller is "ddi_auto" and is located in Riverview (Brisbane). This item can be shipped worldwide.